Magnum’s services are free. 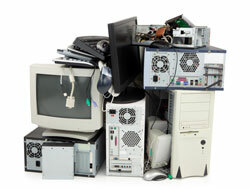 The bulk of its income comes from electronics manufacturers, who must subsidize the collection and recycling of the electronic goods they produce under New Jersey’s “manufacturer take-back” program. The sale of scrap metals augments this income. Magnum collects, transports, records and dismantles the waste, producing 30 different commodities (a single computer will be broken down into 18 commodities). Some materials (mainly metals) are sold for reuse, others sent to landfills. For hazardous materials, Magnum partners with companies like Electronics Recycling International (ERI), which has won praise for its environmentally sensitive disposal technology. Martorano is passionate about getting the word out about the hazards of e-waste and the laws mandating its proper disposal, and making sure it doesn’t end up contaminating the environment here or in third world countries where it is often shipped. For more info, visit magnum-llc.us.